Definition, History of Iron Age Crafts on Upper Danube.  What is Hallstatt Culture?  Where Was Hallstatt Culture Practised?  Where Were the Main Hallstatt Archeological Discoveries Made?  Why Was Hallstatt Centred in Austria?  What Peoples Were Involved With Hallstatt Culture?  What Are the Main Characteristics of Hallstatt Art and Civilization?  What Type of Settlements are Associated with the Hallstatt Era?  What Language is Associated with the Hallstatt Period?  What Type of Arts, Crafts and Designwork are Associated with Hallstatt? artworks please see: Celtic Designs. The term "Hallstatt" refers to an important central European culture of the early Iron Age of the 1st millennium BCE - centred on Austria and the Upper Danube area - which is strongly associated with the arrival of Celtic tribes from the steppes of southern Russia. 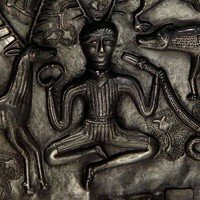 It is regarded as the first clearly defined Celtic culture, and it remained the principal early civilization of the region from around 800 BCE until superceded by the La Tene culture in the fifth century BCE. Where Was Hallstatt Culture Practised? The culture was centred around Austria, but Hallstatt styles spread out into two zones: an eastern zone encompassing Slovakia, western Hungary, western Romania, Croatia, Slovenia, Austria and the Czech Republic; and a western zone which included southern Germany, Switzerland, northern Italy, and eastern France. Thus by the 6th century BCE, it extended roughly 1,000 kilometres west to east, from the Champagne-Ardenne region of France, across the Upper Rhine area of southern Germany and Switzerland, into the upper reaches of the Danube in Austria, as far as the Vienna Basin and the Danubian Lowland in the east. North to south it ran from the Main river, Bohemia and the Little Carpathian Mountains, to the Swiss plateau, the Salzkammergut and Lower Styria. Where Were the Main Hallstatt Archeological Discoveries Made? The actual name of the culture derives from the excavation undertaken near the village of Halstaat in Austria, situated in the salt-mining region of Salzkammergat. Here, in the 1870s, a team of archeologists from the Academy of Sciences in Vienna found more than 2,000 graves - containing both cremated and interred remains, along with caches of weaponry, armour, jewellery, pottery and other artifacts, many decorated in an early Celtic "symmetrical" style, employing design motifs of the ancient Danubian tradition mixed with Greek and Etruscan artistic influences. In 1997, the location of the find was designated a United Nations Educational, Scientific and Cultural Organization (UNESCO) World Heritage Site. Other Hallstatt archeological finds were made at Burgstallkogel in the central Sulm valley (near Leibnitz, Austria), which appears to have been a major centre during the Hallstatt C period. Chariot burials of the Hallstatt period were unearthed at Býcí Skála, Vix and Hochdorf, while other discoveries were made at Heuneburg on the upper Danube, Mont Lassois near Châtillon-sur-Seine in eastern France (including the opulent Vix burial site), and the Slovakian hill fort at Molpír. The most significant hoards of Hallstatt bronze artifacts were found in Romania. Why Was Hallstatt Centred in Austria? The geographical locus of the culture was determined by economics. From its 400-metre deep mine shafts, Salzkammergat exported salt all over Europe, and this lucrative trade - together with control of trade routes along the Danube - financed and facilitated the development of an advanced iron-making industry in the region, whose iron ploughs, tools and weapons gave Hallstatt people a marked technological edge over other tribes. Thus in a nutshell, Hallstatt was based on salt and iron. One should note that the use of the iron plough was instrumental in greatly extending areas of cultivation, leading to a significant increase in agricultural productivity and prosperity. This in turn led to a rise in the demand for land, which resulted in an extension of the culture into new areas. What Peoples Were Involved With Hallstatt Culture? The main practitioners of Hallstatt were Celts. Although we lack precise information about their origins, they are believed to have migrated from the steppelands of southern Russia and the Caucasus, an area previously home to the Bronze era Maikop culture, noted for its skills in metallurgy and general crafts. Because of this, Hallstatt is seen as the first homogenous Celtic civilization. What Are the Main Characteristics of Hallstatt Art and Civilization? Hallstatt is noted for its Celtic metalwork, particularly its finely made iron weaponry and tools, as well its bronze-based artifacts, but relatively few silver or gold items. Archeological finds indicate a way of life that far exceeded a simple farming culture, and analysis of burial remains reveals a class structure topped by a wealthy aristocracy of chieftains and other VIPs. The era is commonly divided into four phases: two (A and B) relating to the pre-Hallstatt era, and two (C and D) relating to Hallstatt proper. This pre-Hallstatt period was preceded by several overlapping traditions including the Bronze Age Bell-Beaker culture (c.28001900 BCE), the Unetice culture (c.2300-1600 BCE), and the central European Tumulus culture (c.1600-1200 BCE). During this period, which confusingly is also known as the Urnfield culture (c.1300-800 BCE), iron was rare, and deceased people were cremated and their remains interred in urns under low mounds or in cemeteries of flat graves. This pre-Hallstatt period was characterized by a return to tumulus or barrow burials, although the practice of cremation remained. Early iron tools appeared. Hallstatt proper begins. Although it developed from the preceding Urnfield civilization, it witnessed three key changes. First was the introduction of more advanced iron manufacturing technology: characteristic weapons included long, heavy iron and bronze swords with scrolled chapes, and the famous winged Hallstatt axe, while iron ploughs also appeared. Second, inhumation replaced cremation as the main method of burial. Third, society became sufficiently prosperous to support a clear hierarchy, whose upper ranks were interred in richly furnished graves. This period saw a further growth in affluence, resulting in larger collections of weaponry, tools and day-to-day artifacts being interred to help the deceased maintain a proper style in the afterlife. Metalwork, weapons and horse-trappings became more ornate. Typical metal objects produced included: the dagger sword with a horseshoe-style or antennae hilt; together with a range of jewellery such as brooches, clasps and ring ornaments. Early archaic Greek pottery appears in the western Hallstatt zone, along with numerous objects evidencing widespread trade with every corner of the Mediterranean, and as far east as China. What Type of Settlements are Associated with the Hallstatt Era? Settlements were usually fortified and located on hilltops, and typically included their own blacksmith forges, along with metal workshops of bronze-smiths, silver-smiths, and goldsmiths. Excavations at these ancient sites from late Phase C onwards have revealed a number of large and opulent graves containing chariots (made from iron or lead), together with hoards of elaborate brooches, rings and bracelets made from bronze and gold, as well as a quantity of costly imported artifacts such as ceramic pottery. What Language is Associated with the Hallstatt Period? Historians believe that early Hallstatt (Phases A and B) is linked with Proto-Celtic, the basic root tongue of all known Celtic languages, while Phase D is usually associated with the gradual diversification of the language into different types, as Celtic traders and tribes began spreading slowly westwards into southern Gaul and eastwards towards Asia Minor. In due course, there emerged three linguistic traditions: Celtiberian, Goidelic and Brythonic languages. What Type of Arts, Crafts and Designwork are Associated with Hallstatt? Celts brought several artistic traditions with them from Russia, notably in metalwork. These, together with indigenous central European styles, and imported designs from Greece and Italy, harmonized to form the Hallstatt style. Being a practical people, Celtic art was never going to develop along the lines of Greek sculpture or Greek pottery, although it borrowed quite heavily from the Hellenic idiom. Instead, it centred on the ornamentation of utilitarian items (weapons, chariots, armour, personal accessories), together with the creation of high quality jewellery (brooches, rings), often employing fine techniques, contrasting colourwork and extravagant patterns. The latter included such standard Celtic motifs as spirals, animal designs (zoomorphs), knotwork and fretwork, with images frequently arranged in pairs to satisfy their appreciation for rigid symmetry. Hallstatt expertise in metalwork design would reach new heights both during the La Tene culture and much later in the early Christian era, exemplified by precious objects and illuminated gospel manuscripts made by Celtic craftsmen in Ireland and Britain. The latter was one of the great highpoints in the history of Irish art. Although we still have much to learn about Hallstatt culture, not least more details of its ordinary citizens and their everyday routines, it appears to have been sufficiently successful to provide a stable and relatively cohesive social system, characterized by significant commercial and agricultural prosperity. It would also have been recognized and valued by contemporary Etruscan, Hellenic and other emerging civilizations, as both a trading partner and regional power, especially for its control of the waterway trade routes along the Danube, Rhine and Rhone rivers. Indeed, the emergence of powerful Celtic Hallstatt chiefdoms along these routes and their influence with Mediterranean commerce would be an important factor in the development of the coming La Tene culture, which superceded Hallstatt around 450 BCE. One might say that before the archeological finds at Hallstatt, central and western Iron Age, Europe was a mere shadow compared to the great civilizations of the Mediterranean basin. Since then, however, it is clear that Celtic civilization was a significant force in the European scheme of things, and - as it happened - would soon demonstrate its full potential in the coming epoch of La Tene, with migrations to every corner of the Continent and masterpieces like the Broighter Collar, the Petrie Crown and the Gundestrup Cauldron.